If you make a purchase via a link on this site, Card Making Circle may receive a small commission on the transaction - at no added cost to you. 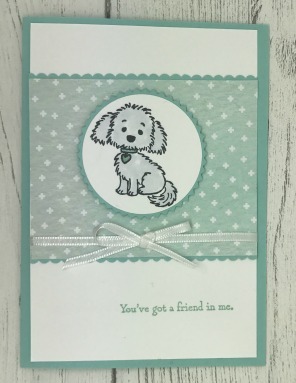 Dog lovers will adore these cute dogs cards, created with the Bella and Friends Stamp set from Stampin Up! The cards use the same basic card making supplies making them economical and quick to make. Cut rectangular shapes from a sheet of designer paper to fit onto your layer one. Cut a strip of cardstock to size. Press the card into the punch so it goes right to the back of the punch. Press down to cut your border. Move the card along the back of the punch making sure to line the cut card with the pattern on the bottom of the punch. Press down to punch again. Once everything is ready you can start stamping your images. Use Black Memento ink to stamp images if colouring with alcohol markers. Or use a basic black ink for other colouring mediums. Decide how you are going to place your images on the card. For some images I used a 2" circle punch and layered with a "circle" from the Starburst punch. With others I trimmed the image to fit the top layer. 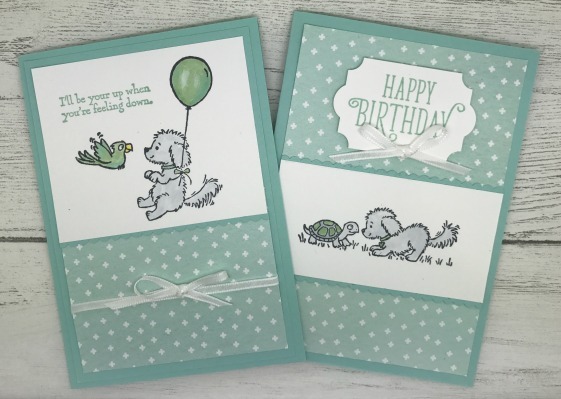 The real versatility of these cards is the way you can mix and match different sentiments. 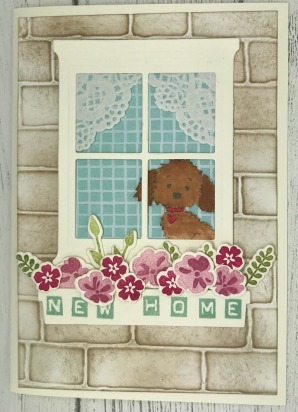 I used sentiments from the Bella and Friends stamp set and Happy Birthday stamps from other sets. Finally, add white satin ribbon for a finishing touch before mounting the layer on the card base. 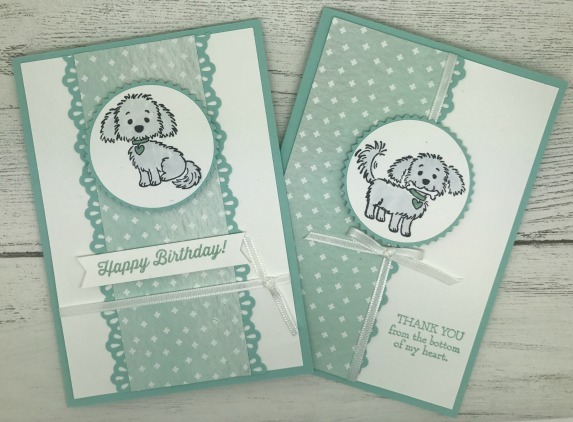 Both cards use the same dog stamp but they are completely different! The New Home card is a more complex and time consuming to make. Have a look at the Card Making Techniques page to see how you can vary your card designs. Combining a couple of techniques together can produce some amazing results!